Vic Hennegan has embraced the many ideals imparted to him as a long-time STAR'S END listener. 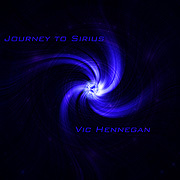 On the album Journey to Sirius (44'37") Hennegan realizes six musical ideas which demand specific spatial organization. As impressionistic images of the cosmos coalesce into musical forms Journey to Sirius makes the mind fire. From its very beginning the listener feels as if they are setting out... somewhere. The surging energy of tightly controlled ripping synth leads unfurls above interlocking rhythm cycles - like wheels turning within wheels. His echoing sequencer patterns are augmented by economical percussive punctuation. The bouncing arpeggiation of notes pulses with energy, then shifts moods once more. Other tracks magnify our distances. These spaces may contain the most emotive power. The restrained gravity; the invisible beat - which cannot be heard. In these small parts we find the album's soul. Such is the duality of Spacemusic. The sounds and music are so delightful to our senses, yet the effects of this genre constantly draws us away from the physical world and all its sensations, and further into our own internal realm.